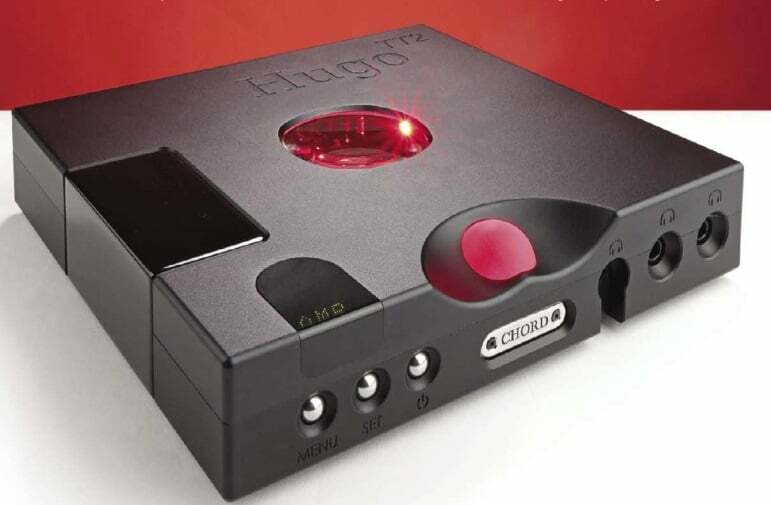 Chord Electronics Hugo TT2 DAC now comes with an astonishing 98,304 taps. Noel Keywood listens in – then adds the new M Scaler for a few taps more. Products from Chord Electronics are always fascinating – even exciting, sometimes confusing. And that’s just what I found when reviewing Hugo TT2 with M Scaler. Notes in the handbook allude to the ‘power’ of Hugo TT2’s audio outputs. Chord Electronics explain there are discrete power amplifiers in Hugo TT2 that can drive loudspeakers direct, especially sensi­tive horn loudspeakers. We drove a pair of Tannoy Westminsters – large horns – from a portable Mojo in our January 2016 issue. Could Hugo TT2 drive loudspeakers, slashing system cost? More later! Let’s look at cost. Hugo TT2 – a substantial sum. The TT means it is a table-top version of Hugo, more expensive and without batteries. It has a partnering 100 Watt power amplifier that you’ll see in many website shots, TTOBY. However, it will drive any power amplifier. M Scaler and I talk about this separately on following pages just for clarity. else except ESS (although AKM get close). However. Rob Watts states that where other designs have digital filters with hundreds of taps and make compromises as a result Hugo TT2 now has 98.304 taps in its filter, fed by a xl6 oversampled signal. M Scaler ups this to a massive I million taps, again fed by a xl6 oversampled signal. Chord Electronics sent us M Scaler with Hugo TT2 so we could hear the difference, a task made easier by our Martin Logan electro­static loudspeakers. And our ability to measure the thing: there are only two analysers in the world able to do this – they have one. we have the other. Interestingly they quote a class-leading 127dB dynamic range and we measure 128dB from amplifier output, or 124dB from DAC output – both outstanding values. In addition to being a unique DAC, HugoTT2 is also a pre-amplifier and headphone amplifier they say. Hmmm…Yes. it is. but it does not have analogue inputs, so cannot accept external analogue sources. 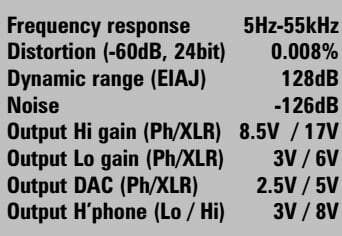 The ‘pre-amplifier’ bit relates to the fact that very high gain is available, enough to drive a power amplifier direct or act as a power amplifier in its own right. Two gain settings (Hi and Lo). a big illuminated spherical volume control (centre) and both phono-socket (unbalanced) and XLR- socket (balanced) analogue outputs being fitted to make it all happen. These days headphones rule and Hugo TT2 is designed to cope, with no less than two full size I Min (6.35mm) jacks, plus a 3.5mm mini jack, so no adaptors are needed. Those on-board power amps let Hugo TT2 drive headphones down to 16 Ohms or lower, with massive voltage swing so even the most difficult of headphones offer no challenge. An unusual addition is three selectable levels of Crossfeed between channels to give a more loudspeaker-like presentation. The only omission is the lack of a balanced output. Plugging headphones in disables amplifier mode (i.e. the analogue outputs). There are arrays of digital inputs. A fully isolated USB input allows Hugo TT2 to be used as a computer’s headphone DAC or to send audio from the computer to the hi-fi. The TT2 accepts native DSD (PC only) up to x8 (DSD 512). At present double-rate x2 DSD (DSD 128) is about the limit for music files, because of their size. If you run a PC a DSD driver must be downloaded from Chord Electronics to run native or DoP; if you run a Mac the paid-for Audirvana Plus app. sends via DoP that works to DSD 128 only in Hugo TT2. In addition to the USB input there are two electrical S/PDIF digital inputs via BNC sockets, not the usual phono sockets. They can be used indepen­dently. as usual, to accept a digital stream from outside sources, or together as a special DBNC (Dual BNC) input to accept the DBNC output of M Scaler. There are two optical inputs for which Chord Electronics now supply matching cables to ensure they reach 192kHz sample rate. There are no AES/EBU balanced digital inputs. And there are two digital outputs for future use with Chord Electronics products. Another input is Bluetooth with aptX compression, for streaming from mobile phones or any other device such as iPads and portable players that now mostly come with Bluetooth. 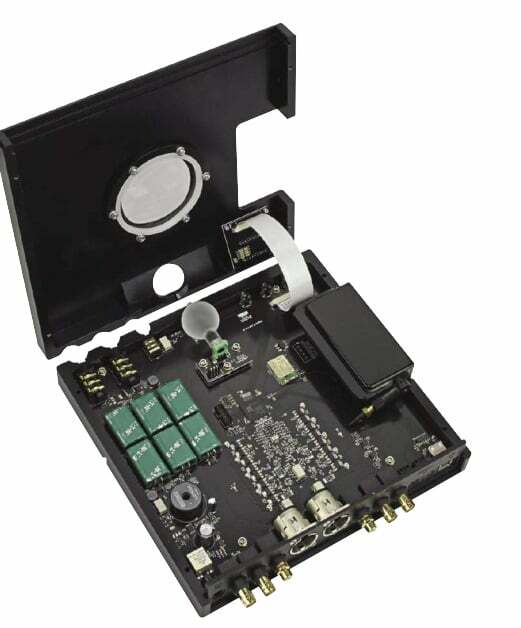 A small, light (plastic) and simple remote control unit is provided with all functions, including volume control, input selection and filter selection. There are four filters, an incisive neutral filter (Filter I) that offers ‘absolute reference’ they say. and the same with high frequency roll-off (Filter 2) to ‘remove noise’ from hi-res files of 88.1 kHz sample rate or higher. Then there’s a filter with ‘warmer tone’ (Filter 3) and again the same with high frequency roll-off (Filter 4). Differences between these filters were not great and sonic differences small. They work with DSD also to reduce high frequency noise (2 and 4). a problem inherent to DSD. A small and light remote with volume, filters and inputs. The illuminated volume ball on a shaft at front, con­nected to green potentiometer behind. Six green super-capacitors (left) bolster the power supply. At right is the Bluetooth radio module. At centre the square black FPGA chip that holds the WTA filter and DAC. Like all Chord Electronics products Hugo TT2 is of exceptional build and finish. The case is machined from solid alloy, making it wonderfully strong and with superb contours and detailing. The company light up the whole device in their usual style: the spherical volume control at centre changes colour to show gain, the colour palette moving from red (low) up to green (sensible) and then into blues to purples and eventually white (max). Internally, the LEDs change colour on the circuit board to indicate sample rate (or DSD) and this is visible through the top window. Case dimensions are 235mm wide. 223mm deep and 46mm high, with a weight of 2.53kgs. Power is supplied by a Chinese external switch-mode power supply block that delivers 15V at a high 4A through a cable 2340cm (11 ft) long in total. Chord Electronics exclusively use switch-mode supplies and are happy with them, even though they are shunned by many others. To compensate for any possible limitations in supply transient behaviour ‘super capacitors’ are fitted to store charge within the unit. At left, twin BNC output sockets (for future products). Next along, two large XLR socket outputs flanked by phono-socket outputs. Then come twin BNC digital inputs that together form a DBNC input. At right are TOSLINK optical inputs and a USB B computer connection. produce such power on a continuous basis. It works fine and goes loud, but very loud will overheat (there are protection circuits). Small loudspeakers are insensitive so expect lower volume – but they will work well enough on a desk where speakers are close to your ears. I used Martin Logan ESL-X hybrid electrostatic loudspeakers driven by a Creek Evolution 100A amplifier via its direct XLR inputs (no volume control) through Chord Company Epic XLR cables. Loudspeaker cables were Chord Company (not Chord Electronics; they are different and unrelated companies) Signature UL cables. The unit was run in Amp mode, mostly Filter I and with volume set at light blue where full dynamic range is available. Digital was delivered from an Oppo BDP-20SD Universal player acting as a CD transport, coupled optically to the Hugo with the cable supplied that was a tighter fit into the TOSLINK socket than our cables. A MacBook Pro running Audirvana Plus provided hi-res and DSD replay, again connected by the supplied USB cable. I started off with high dynamic range (uncompressed) rock from CD and with Nils Lofgren singing ‘Keith Don’t Go’ got quite a shock. It was obvious straight away that this DAC has the company’s trademark sound – but supercharged. In basic character think crystal clear and vividly insightful, with no hint of warmth. There was an airy spaciousness to the sound, made more apparent by a very broad soundstage where the audience yelped and shouted from hard left to hard right in lively fashion, yet they were clear of the vocals with well-identified distance. This sense of dimensional resolution with hard images on a wide yet firm canvas remained throughout my listening. Lofgren’s rapid finger-picking was super clear, with better timing between fine details from the strings than I have ever heard, giving a sense of intense insight. It was breath-taking – and not just because of the qualities mentioned but because of a sense of great dynamic contrast too. An astonishing level of revelation was obvious from this track alone, as well as ability to lay out the acoustic being picked up by Lofgren’s mic. “breathtaking clarity, giving a starkly clear and concise sound unmatched elsewhere. Safri Duo’s ‘Samb Allegro’ – tremen­dously fast but punchy bass. It seemed perfectly timed and I heard texture where I had not before, here in the synth kick-drum beat that underpins the track so dramatically. Modern hi-res recordings such as Marta Gomez singing ‘Maria’ (24/96) bettered CD in obvious fashion by fleshing out a performance with more intense inner detail – making CD sound a tad barren by way of contrast. With this superb recording, images were here from stone with clear space between them – and a vivid dynamic all but defining what high-fidelity must be. Fleetwood Mac’s ‘Dreams’ (24/96) – a hi-res transcription from an old analogue master tape (1977) – hit me with a dramatic start from Mick Fleetwood’s drum kit that had surgical punch – but some of the cymbal crashes were too well revealed. I know the top end of this track is a bit raspy and here Hugo TT2 made the fact obvious. In effect it revealed limitations in the transcription or original recording. Comparisons got interesting with Diana Krall singing ‘Narrow Daylight’ on hi-res PCM (24/96) and DSD64. To my surprise there was not much difference. Both were relentlessly sharp in timing, clean and clear. DSD without the romance I associate with it. With classical DSD tracks like Dejan Lazic playing Brahms’ ‘Piano Concerto No3’ although there was fabulous insight – the almost relentless clarity of this DAC made for a lack of organic warmth that was not what I expect from DSD. Again though, the tremendous sense of timing and broad sound stage gave Hugo TT2 a sense of rigid composure no other DAC can match, strings coming through with assured presence. After writing the above I was told Hugo TT2 converts DSD to PCM. presumably because the custom FPGA chip lacks a DSD process route with low pass filter. This explains what I heard though. With hi-res classical such as the Minnesota Orchestra playing Korsakov’s ‘Dance of the Tumblers’ from The Snow Maiden’ (24/96), TT2’s large canvas made the orchestra sound both vast and dynamically engaging, kettle drums having sudden and solid power when struck, the instruments all seemingly well separated with clear air between them. Again, it was time to run up the volume! This was something I kept doing and suddenly the penny dropped. Using Amp mode at high gain – light blue and above on the volume sphere – maximises dynamic range. And I was running at light blue and above, effectively achieving a dynamic range of 130dB or more. That’s way above the 120dB of top class rivals. An issue Hugo TT2 raised was that of ‘insight’. It appears to have insight into digital, as it were. Transcriptions of old analogue perfor­mances had their faults revealed and did not sound wholly better. Modern hi-res recordings fairly assaulted me with everything from detail to dynamics, sounding almost too good to be true. Good CD was fine but old CD was revealed as. well – old CD and not so nice. Bluetooth worked well once I had entered the PIN number demanded, which the handbook fails to mention: it is 0000. Interesting that the limitations of aptX compression became quite obvious in contrast to all else. And finally Hugo TT2 did indeed drive our Martin Logan ESL-X loudspeakers quite loud (Hi gain) via the XLR output sockets, using a pair of adaptor leads I soldered up (XLR to 4mm line socket). At times I fancied there was a tad more detail but then there was less low-end drive. David Bowie’s ‘Suffragette City’ missing a bit of propulsive power. So a bit of a compromise here but do-able all the same. Headphones are best used at Lo gain that limits output to 3V – more than enough. Sound quality showed all the traits I heard with loudspeakers, cross-feed (XFeed) making the experience less in-head. Our DIY loudspeaker adaptor leads, XLR to 4mm line socket (not available commercially; go to RS Components). peculiarly tight yet punchy bass. It is a little short on warmth, especially with DSD. majoring on deep analysis instead – undoubtedly its forte. To hear CD and hi-res like you’ve never heard it before, and as you will not hear it anywhere else, this is the DAC to audition. The crucial EIAJ Dynamic Range value of Hugo TT2 was 124dB in DAC mode and 128dB in Amplifier mode, set to Hi gain and with volume advanced to avoid output clipping (light blue on the volume control). Both are exceptionally high values not bettered elsewhere, although ESS DACs match the figure. DesignerRob Watts insists distortion is more important than dynamic range and here the Hugo TT2 produced a record low value of 0.008% at -60dB with 24bit – see our analysis. At best rivals manage 0.02% so Hugo TT2 has half their distation. Note that Chad Electronics only quote distation at full scale <0dB FS) to match other manufacturers. Our -60dB test is more meaningful and now widely used. S/PDIF and USB gave identical figures. Distortion with CD (16bit) measured 0.19% at -60dB. not a lot different to usual due to quantisation noise inherent in 16biL Dynamic range was 101dB. The S/PDIF electrical (BNC socket) and optical digital inputs (with supplied optical cable) both accepted 192kHz sample rate PCM, frequency response measuring flat to 55kHz (-1dB) with Filter 1 and 3 before slow roll off to the 96kHz upper theoretical limit, our analysis showing Filter 1. Filters 2 and 4 had a 21kHz (-1dB) upper limit – low. They are quite strong filters..
At Lo gain the headphone outputs delivered 3V max. at Hi gain 8V max, – more than enough for all headphones. Distortion an dynamic range values were identical to Line out at Hi gain, just tad lower at Lo gain. Results with M Scaler were identical although dynamic range did reach 129dB. Hugo TT2 delivers class leading measured performance in all areas. It has huge dynamic range and unusually low distortion. OUTSTANDING – amongst the best. Fabulous DAC with analytical and precise sound. Unimpressive with DSD.